Please make your selections carefully since all charges are for time out, whether used or not. *Special prices are available for rentals exceeding one day. Responsibility for equipment remains with the lessee. Be sure the equipment is secured and always protected from the weather. We DO charge for missing, broken, or water-damaged items. The use of colored crepe paper and other colored materials has a tendency to cause irremovable stains on tents. Under no circumstances should any colored material come in contact with our tents. Duct tape, or any other adhesive material, should not be applied to tent poles or tent fabric. No pins should be used in tent fabric. All tables and chairs must be rinsed free of food particles. 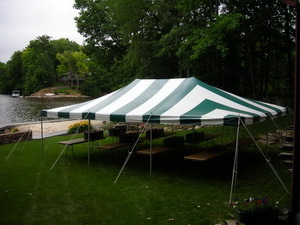 Tents and Tables should be left setup as delivered & chairs folded down and restacked on tables.